Artis Altai, located in Mongolia in the heart of the Gobi Desert, is an artisan’s workshop that provides employment opportunities for women who have little or no income. Artis Altai combines traditional felt making expertise, used since the time of Genghis Khan, with innovative contemporary craft designs. Every purchase contributes directly towards improving the living conditions of women and their families while offering hope, confidence and dignity through professional activity. 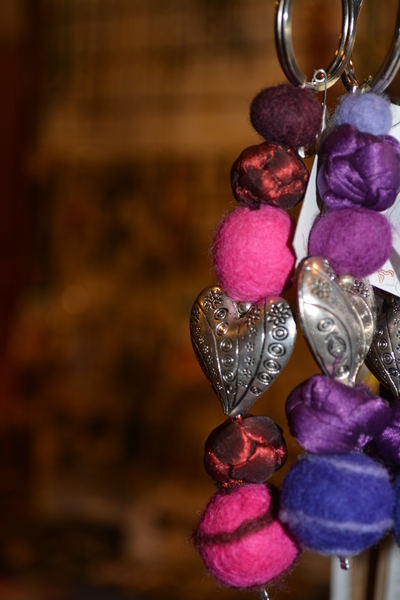 This unique and lovely keyring is hand crafted felt beads, traditional Mongolian silk del beads and features a silver decorative heart bead. It is approximately 12 cm long. The keyring itself is large and strong. The beads are made using all new materials, wool and non-toxic dyes.